Antonio Huete Jimenez’s ‘libhammer‘, a library to make various Hammer functions available to userland programs, has been added. It implements ‘hammer info’ only at this point, if I understand correctly. Samuel Greear, Jan Lentfer, and others are looking at Postgres scaling on DragonFly. The work they are doing isn’t in the tree yet, but here’s a graph showing some of the performance differences. It’s snowing in the northeast U.S., which makes me happy! Keep going, sky! I mentioned issues over the time zone database previously, but there’s a new home, and we’re still getting updates in DragonFly. And, it’s Dennis Ritchie Day. (via) That linked article does a good job of describing just how universal his influence has been. I’ve linked to similar deals before, but this one’s quite cheap: the Power Squid power strip sold as surplus. I find the design and name both great. I like this article on web advertising just because it has blocked-out screenshots that show exactly how much space gets used up by ads. Unrelated link of the week: Manly Guys Doing Manly Things. Most of the jokes revolve around games you may or may not know, with the occasional realistic experience that I’ve had myself. Michael Lucas is building jails on DragonFly, and his story of doing so works pretty well as a how-to guide. John Marino’s moved GCC from 4.4.6 to 4.4.7, but you’ll have to see the changelog for details. Except it’s so new it isn’t listed… yet. Sepherosa Ziehau made some changes that led to a 10% and then 20% gain (don’t know if that was cumulative or separate) in network speed for DragonFly. That’s great! It only has a noticeable effect if you’re on 10G Ethernet, though. The obvious answer to that: upgrade your network. Francois Tigeot recently presented a set of slides about Hammer at a recent Irill conference. PDFs of the slides are available at his site, in English and French. Did you know that there’s a BSDDay 2011 in Bratislava, Slovakia, on November 5th? Well, I do thanks to a random Google search and now you do too. You and I both need to keep watching BSD Events. 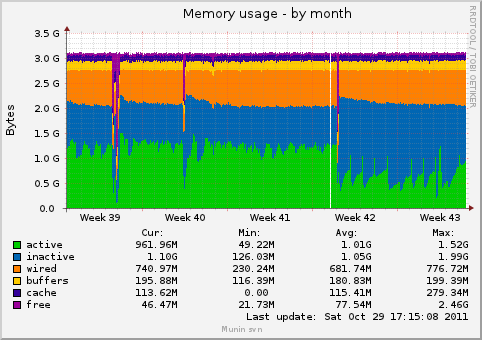 Samuel Greear graphed the performance differences for Postgres and MySQL on DragonFly, before and after the recent VM changes. Note that 1: this was done a little while ago, so I think the performance difference would be even greater now, and 2: this was graphed versus the already-performing-better 2.12, not the current stable release of 2.10. Not a lot of links this week, for some reason. The best obituary I’ve seen yet for Dennis Ritchie, where he’s contrasted with Steve Jobs. The best paper abstract ever. Michael Lucas documents his DragonFly update. Our tcplay TrueCrypt implementation is getting noticed. pkgin-0.51 is available in pkgsrc-current, though it’s not in the most recent quarterly release. Your unrelated comics link for the week: Oglaf. This week’s OK, but it’s frequently NSFW, and frequently hilarious. Google’s running the Code-In project again for 2011, where open source projects mentor 13-17-year-olds on a variety of small projects. DragonFly participated last year and had lots of good work done. However, we need ideas, the more the better. Please add whatever comes to mind. Got an r600-based video card? That would be a recent ATI card, though I don’t know exactly which model name. Samuel Greear has imported David Shao’s DRM work, originally for Summer of Code, last year. Most newer Radeons should work (?). There’s a rare crash in DragonFly 2.10, where applications would segfault. The system would run find. This is apparently more likely to happen in 2.12, though reports on this vary. It’s real, though. Matthew Dillon went looking for this bug, and happened to roll back vm_token, the last lock in DragonFly that presented a serious impediment to multiprocessing. It’s a big patch. It fixes the problem, which is great! It also happens to make DragonFly buildworlds almost twice as fast depending on the number of cores in the system. Holy crap we want to get that out… but it makes some significant changes to the system and needs to be tested. So, the next release probably won’t be for a few weeks. If you want to help, build master and do something with it – move data, run server programs, whatever. Report crashes. This performance improvement is worth working for. I know this happens normally, but I like to point out that it exists. From the recent pkgsrc-2011Q3 bulk build reports I posted, Samuel Greear found two problems to fix, and thanks to him and OBATA Akio, net/net-snmp and devel/poco are fixed for DragonFly. I build this up over the course of the week, so I’m never sure what to put here. Does it matter? The meat is the links. The JFDI Theory of Language Adoption. This applies to operating systems too; create the shortest possible path between people and what they want to do on that OS. NetBSD has added SQLite to the base system. (via) Interesting… having a database(ish) always available leads to some new ways to keep data, outside of the usually “stuff in a text file” format. Your totally off-topic link for the week: Fat Birds.